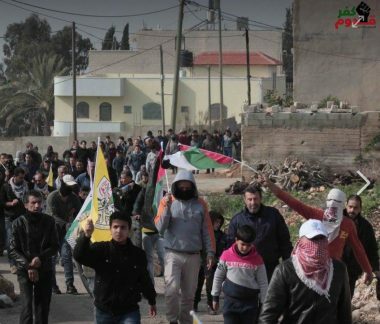 Despite the heavy rain, dozens of Palestinians, and international peace activists, marched in the town of Kufur Qaddoum, east of the northern West Bank city of Qalqilia, and chanted for against the ongoing illegal Israeli occupation, and for the release of the detainees, especially those facing serious conditions and are deprived from the needed medical treatment. Morad Eshteiwi, the coordinator of the Popular Committee against the Annexation Wall and Colonies in Kufur Qaddoum, said the protesters marched after Friday prayers, and headed toward their lands, close to the illegal Kedumim Israeli colony, which was built on illegally-confiscated lands. He added that the protesters chanted for the liberation of Palestine, including its occupied capital Jerusalem, and called for the release of all political prisoners, especially those who are facing serious and deteriorating health conditions, but are denied the needed specialized care. The protesters also condemned the death of detainee Hussein Hosni Atallah, 57, from the northern West Bank city of Nablus, who died at Assaf Harofeh Israeli medical center; he suffered from cancer in his lungs, spine, liver, pancreas and brain, but was denied the needed medical treatment until it was too late. Eshteiwi said that the protesters denounced the illegal Israeli policies of depriving the detainees from the needed medical care, especially specialized treatment, an issue that caused many to suffer serious complications, and led to the death of several detainees.